The previous design of stadia.gr had a background featuring a special image. This aimed to remind the subject of this website to all visitors. The site of the Panathenaic Stadium was originally a small natural valley, between the two hills of Agra and Ardettos, over Ilissos river. It was transformed into a stadium by Lykourgos in 330-329 BC for the athletic competitions of "Panathinea", the greatest festivities in ancient Athens. Between 140 and 144 AD, Herodes Atticus restored the Stadium, giving it the form that was found at the 1870 excavation: the horseshoe construction with a track 204.07 meters long and 33.35 meters wide. 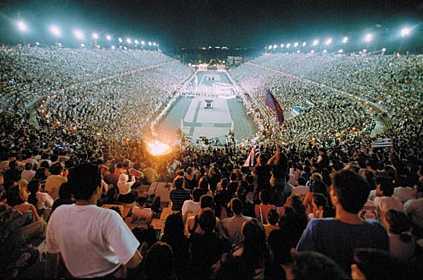 It is believed that the Stadium had a seating capacity of 50,000 people. In the Roman times it was used as an arena with the addition of a north semicircular wall. 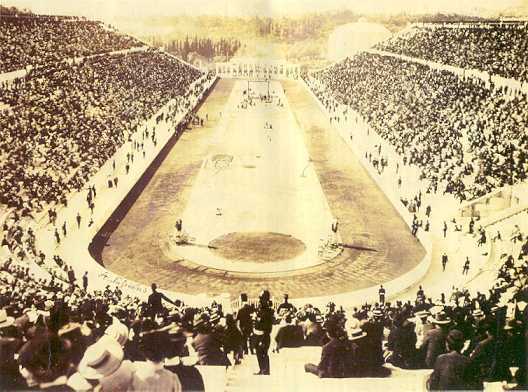 The modern times restoration of the Stadium was conducted by G.Averof at the end of the 19th century, for the first Olympic Games that were reborn in 1896. 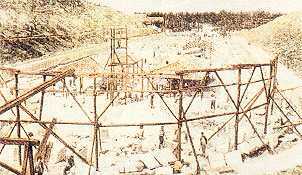 The Stadium was rebuilt with marble from Mt Penteli, the same kind that was used 2,400 years before, for the construction of the Parthenon on the Acropolis. It could now hold over 60,000 spectators. The total cost was 1 million GrD, a huge amount of money in those days. The Panathenaic Stadium holds a unique world record: on April 4 1968, AEK Athens won the European Cupwinners' Cup (beating Slavia Prague) in front of 60,000 spectators, the largest crowd ever to attend a basketball match. 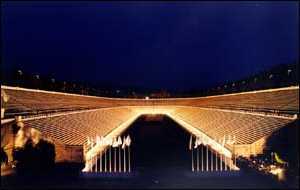 The Stadium (owned by the Greek Olympic Committee) is now a tourist attraction, used only for special events. It will be used in the 2004 Olympics; the marathon race will finish there (following the tradition of the 1st Olympics). It will also host the finals of archery. A visit to the Stadium is an absolute "must" when in Athens. It is located in the centre of the city, on Vassileos Konstantinou Avenue, on the east side of the National Gardens. The Panathenaic Stadium (in Greek: Panathinaiko Stadio, meaning "stadium of all the Athenians") is also known as Kallimarmaro (which means "made of fine marble"). Some foreigners also call it "Olympic Stadium". When you're in Athens (especially when you're looking for directions), NEVER call it this way, as people will think you are talking about the modern Olympic Stadium, in the northern suburbs. Also, try not to confuse it with the home ground of Panathinaikos FC, Apostolos Nikolaidis Stadium (aka "Leoforos"). All this may sound a bit perplexed, but if you follow this advice, you'll never get mixed up. Call it either "Panathenaic" or "Kallimarmaro" and people will know what you are talking about. Close this window, or (if you came here from another site) go to the main page of stadia.gr.